There is always some html comments in your source code that can indicate you are using WordPress. This option not only remove these comments but it also compress your page and make it faster to load (and harder to read!). You can use Quick or Safe mode. Quick mode is faster but may have problem with non-standard pages. Safe mode is more compatible but comparatively slower. I recommend to use this option (specially Safe mode) with a cache plugin. Note: this option won’t remove any IE specific comments (e.g. [if IE 8]). If you check your site’s source code you’ll see some additional meta headers generated by WordPress. These metas includes feed URL for that specific page, previous and next posts, short links, Windows Live Writer tags, etc. Most of them are used rarely and you can clean all of them by this option. WordPress adds lots of CSS classes to some elements in your code. For example this is a body class: “home blog logged-in admin-bar no-customize-support”. These class names let you change your theme using pure CSS and are useful when you have no access to PHP files (e.g. wordpress.com blogs). You usually don’t use these classes but stick in your mind that some plugins and themes may use them for better appearance (e.g. WooCommerce). Your feed always displays blog tagline (even if your theme doesn’t). So if you haven’t changed default tagline then you can hide it using this option. 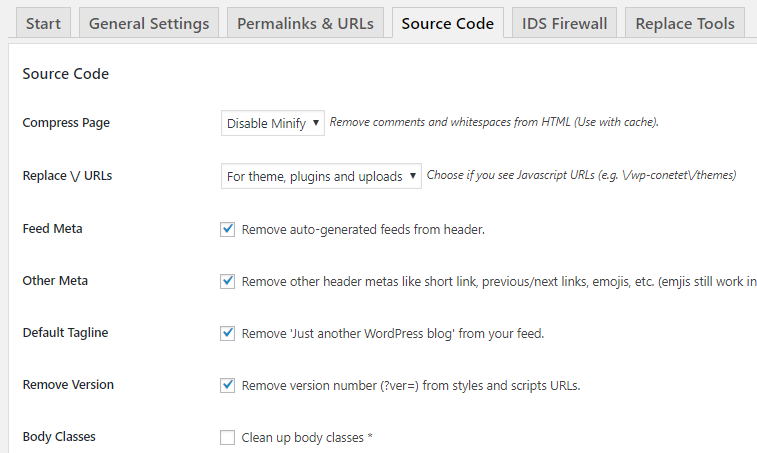 If enabled, this option will remove version number (?ver=) from style and script URLs. If enabled, _wpnonce in URLs will be replaced with _nonce. You can put css/js code here. For example, if you need to overwrite any css code, you can put it in “Internal CSS” box.